Hot Forming Press is a kind of forging equipment used in the manufacturing process, which uses high pressure and temperature to shape metal by plastic deformation. It can be widely used in cutting, punching, and blanking, bending, riveting and forming technology that used in the areas of automobile, tractors, ship and aviation. Lien Chieh Machinery (LCM) is highly involved in manufacturing, trading and offering an extensive range of Drawing Presses, Cold Press, Hot Press, Hot Forging Press, Forming Press, Metal Forming Press, High Speed Press, and Mechanical Press. 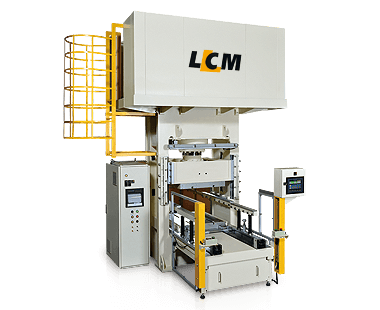 At LCM, we believe that building good customer relationships, developing uniquely tailored machine, solving your production efficiency that is our best superiority. Now, we offer two different specified types of Hot Forming Press Machines that are Tire-Tread Hot Press and Hydraulic Hot Press, which provides design of the precision machined frame and eight-point gib enhances high rigidity, stability and accuracy. We can customize any of our machines to suit your operation. In addition, see below, there are more about the features of the product introduction. We provide these high quality hydraulic press at very affordable rates. If you need further information on the Hot Forming Press, you can try to click the left link, or contact with our sales department on 886-2-2783-8664. Design of the precision machined frame provides high rigidity. Eight-point gib design enhances stability and accuracy. Quality manufacture and design provides low noise and vibration levels. Hydraulic systems are equipped with fault monitoring devices. Programmable logic controls (PLC) with digital display. Press functions and control display can be customized to suit specific applications and requirements. Main pumps, valves, cylinder seals and packings are provided by industry leaders.